Visual Lure recently completed new packaging design for Amino Freeze Pops. 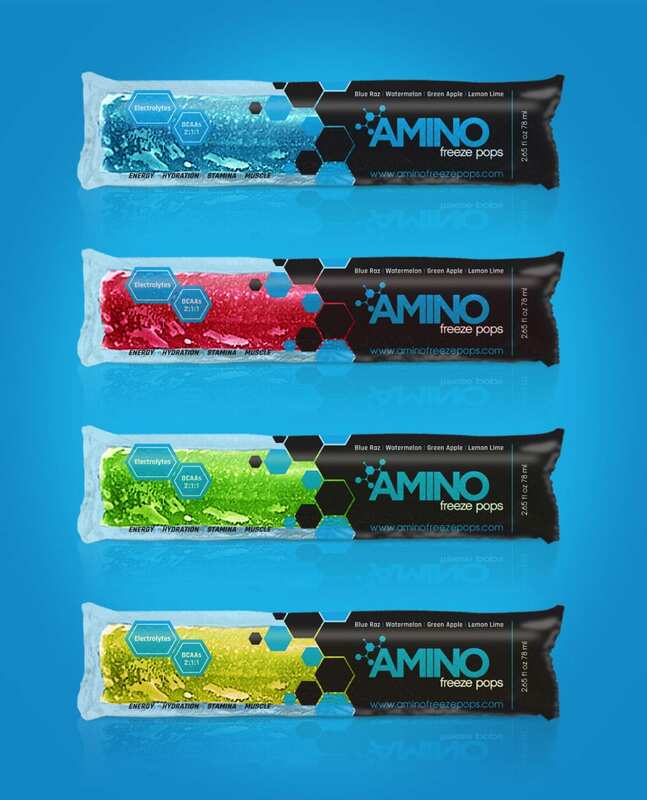 Amino Freeze Pops are frozen treats for adult athletes and body builder that are packed with Electrolytes and BCAAs. Essentially, it is a frozen post-workout recovery drink. They provide a boost of energy, help with hydration, can increase stamina and aid in building muscle. The old design featured icicle shapes that didn’t quite complement the logo/brand, and their attempt to visually highlight the Electrolytes and BCAAs fell short. The new design is much more cohesive and polished. Learn more about Amino at www.aminofreezepops.com. Are you using #hashtags in your social media strategy? If not, you should be, because you never know who will find you when you do. Landing this project is a great example of the power of a hashtag. Here’s the story: We recently completed new packaging design for 2nd Impact, a new supplement company based out of St. Louis, MO. We had just finished some of their designs and we posted them on our Visual Lure Instagram account. When we posted the images, we used the following hashtags: #PackagingDesign, #PackageDesign, #SupplementLabelDesign and #SupplementBrand. Within 30 minutes Amino Freeze Pops had followed us on Instagram, and we were having a conversation over the phone. We think that’s both crazy and amazing! A company based out of Boynton Beach, Florida, a company we would never have run into, is now a client all due to a hashtag.